Site Search Plus Script is the best and most popular version. Easy traffic tracking: returning visitors, how people find the site, search engines, what keywords people type, their countries, browsers, OS, READY - TO - CUSTOMIZE FRONTEND (HTML TEMPLATE), READY TO START AS A STANDALONE SERVICE!!! Create site search portal engine for your website, blog or forum in minutes with php editions of Site Search Portal. Create Site Search portal engine for your website, blog or forum in minutes with php editions of Site Search Portal.A complete portal system with simple and advance searching, as well as a Yahoo! Style directory listing. Also includes non scripted HTML version of templates, and a full corporate ID. A powerful web data / link extractor utility. Extract URL, meta tag (title, desc, keyword), body text, email, phone, fax from web site, search results or list of URLs. High speed, multi-threaded, accurate extraction - directly saves data to disk file. Great PHP Expandable Menu for your web site where the search engines will follow all your menu links! The ultimate Command Center for your Web Site or Intranet/Extranet system - Content Management and Navigation, Instant Messaging, Scrolling or fading News, 'Atomic' Site Search, 'Smart' Internet Search', Multi-level Password Protection and fully-customizable Calendar. Add search capabilities to your web site. Applet Site Content Searcher is a Java Search applet that can explore any web Site, either locally or on the Internet. With Applet Site Content Searcher, you can add Search capabilities to your web Site easy. Search your site without a search engine. Just enter your URL, your query and go! It's like having Ctrl-F (Find) for your entire site. 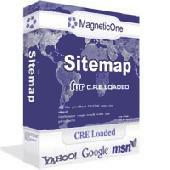 Site Map for CRE Loaded - CRE Loaded Module - is very powerful and flexible module for dynamic site map generation. ToolButton is a free, customizable deskbar that sits on your desktop providing you with a versatile RSS reader, powerful multi-site Search Bar and form filler - no spyware.